Kahal Kadosh Mikveh Israel, “The Hope of Israel,” is the oldest Jewish congregation in the city of Philadelphia, and the second oldest congregation in the United States. It dates its roots back to 1740 when Nathan Levy, upon the death of his child, applied for a grant of land at 9th and Spruce Streets from Thomas Penn, Proprietor of Pennsylvania, to consecrate as a Jewish burial ground. Mikveh Israel is called “Synagogue of the Revolution” because the early founding members of the congregation were very involved in the activities that led up to the war, with many of them signing the Non-Importation Act of 1765. Many of the members were very active in the war effort itself, either directly fighting on the American side, supplying the army with food, ammunition, equipment, and clothing, or contributing funds that made the war itself possible and ensured an American victory. After the war, members of Mikveh Israel remained in regular contact with Washington, Jefferson, Madison, Adams, and the other leaders who wrote the constitution and shaped the country in its earliest days. We remember Hazzan Abraham Lopes Cardozo. Rev. Cardozo was Hazzan of Shearith Israel From 1946 until his retirement in 1984. He was the embodiment of the Western Sephardic liturgical tradition that was brought to North America from Amsterdam via Recife, Montreal, and the Caribbean, among other places. He was the spiritual and musical teacher of the present Rabbi of Mikveh Israel, R. Albert Gabbai, bringing some of his rich influence to Philadelphia. Rabbi Gabbai would often invite Rev. Cardozo to come to Philadelphia for High Holidays and other occasions after his retirement. At 18, “Bram” Cardozo earned his degree as a Hebrew teacher from the Ets Haim Seminary in Amsterdam. A few years later in 1938, he answered an advertisement for a Hazzan who was needed for a congregation in Surinam, Zedek Ve-Shalom. The ad was placed by his future father-in-law, Judah Robles, who was Parnas of the synagogue at the time. After much deliberation over different candidates, Bram Cardozo was chosen because of his credentials and also because the salary, paid for by the Dutch government, and living conditions were appropriate for a single young man. He arrived in Paramaribo, Suriname on September 9, 1939. As it turned out, this appointment saved his life. All of the rest of his family in Holland perished in the Holocaust. Throughout his life, he observed Tisha B’Ab as the Nahalah (anniversary) for all of his relatives that were murdered, as this is the national Jewish day of mourning. Immediately on starting as Hazzan, Rev. Cardozo reunited with the daughter of his former Parnas in Suriname, Irma Miriam Robles, who was working in New York and attending Shearith Israel regularly. They shared many of the same friends and grew close over the next few years. In December of 1950 they became engaged, and had a beautiful wedding on March 11, 1951, officiated by Rev. Dr. David de Sola Pool of Shearith Israel, assistant minister Rev. Dr. Louis Gerstein, and Rev. David Jessurun Cardozo, the Rabbi of sister congregation Mikveh Israel in Philadelphia. Of course, the first piece of furniture they acquired for their new home was a piano — a Baldwin Acrosonic upright. The Cardozos had two daughters, Debby and Judy, born in 1952 and 1955. Rev. Cardozo was devoted to and strictly upheld the Spanish and Portuguese minhag, though in his private life he also appreciated other traditions. In many ways he was a living bridge between the Old World, represented by the Amsterdam Sephardi community, which was made up of descendants of refugees from the Inquisition in Spain and Portugal, and the New World, in the first congregation in America. As the Amsterdam community was being decimated by the Nazis, Cardozo escaped just in time and continued the traditions in the New World. Rabbi Marc Angel, long time Rabbi of Shearith Israel speaking at his funeral in 2006, said that Rev. Cardozo was an ember that survived the ashes of the Holocaust. I just want to share one very small personal anecdote: I used to lead the Friday night Shabbat service at Mikveh Israel. One time, when Rev. Cardozo was visiting for Shabbat at the invitation of Rabbi Gabbai, he led the Friday night service faster than I have ever heard it done. It was so fast, I could hardly follow along. After the service, as I was wishing him a Shabbat Shalom, I remarked on the speed with which he read the service. He replied, with a twinkle in his eye, “they don’t call me the Flying Dutchman for nothing!”. Mark I. Wolfson is the creator of Mikveh Israel History. The goal of the blog is to provide articles on the people and events of Mikveh Israel over the past few hundred years. Mikveh Israel and its members helped shape the Jewish community in Philadelphia and the rest of the country, and established the educational and charitable institutions that set the example for social responsibility in all communities. 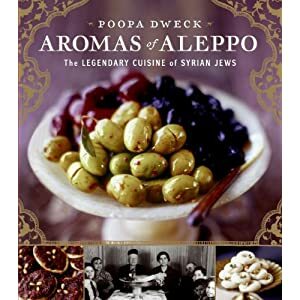 Cooked sweets — purees, compotes, marmalades, pastes, hard candies and whole preserves — are an important component of the Sephardic culinary tradition and social custom. Whole fresh and dried fruits, citrus peel, flower petals, seeds, nuts and even vegetables are transformed into confections of various textures, forms and colors, to be served, with tea or coffee, when folks come a callin’. My own grandparents and great grandparents favored sweets made from quince, almonds, apricots, citrus peel, rose petals, apples, dates, figs and sesame. Depending upon where in the Mediterranean you might be you’d also enjoy sweets made from lemons, pears, sour cherries, grapes, plums, tomatoes, pumpkin, eggplant — you name it. The Moroccan recipe in these pages for Berenjenitas en Dulce — candied baby eggplants — is a fine example. The list is endless. The full recipe after the jump. What makes these confections Sephardic per say is not only how they are prepared but how and when they were incorporated into Sephardic life. As with other Sephardic foods, many sweets, too, carry some specific symbolism or association with key events — holidays, weddings, circumcisions, baby namings, bar mitzvas, etc. They may represent sweetness, purity or, in the unique case of harosi (haroset), even the mortar of the Egyptian pyramids (at the religious school I attended, I was convinced those Ashkenazi ladies who made the haroset they served up really meant for us kids to eat mortar). But never mind that. When it comes from a Sephardic kitchen, harosi is rendered a luscious spoon sweet. Candied almonds may be served at weddings, masapan adds “sweetness” to all celebrations, And so forth. Others are perhaps more quotidian, though no less special, saved for social visits both planned and impromptu. Or for your own household, of course. Everyone’s got their personal favorites and specialties, which keeps things interesting and provides ample opportunity for showing off your confectionary skills. Around our house my mother collected tangerine peels, as did her mother, to make dulse de mandarina — tangerine marmalade — studded with pine nuts. One of my great grandmother’s specialties was dulse de kondja’ — rose petal jam made only from deep red roses, picked only in the morning when the dew-covered petals are at their most fragrant. Most fitting for a woman from The Island of Roses. 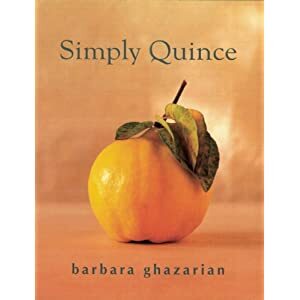 Grandpa was mad about bembriyo, quince paste, which he cooked up in batches each fall during that fragrant fruit’s very short season, as he’d seen his mother do before him. Old habits die hard. Lucky for me, quince paste is a household staple in Spain (where it’s called membrillo). It’s out of this world with semi-soft cheese. The recipe takes anywhere from 6 to 9 hours to prepare; if you’re a fan of slow foods, this one’s for you. This recipe is by Liticia Benatar (born in Casablanca, living today in Caracas) and comes from Dulce lo Vivas by Ana Bensadon. The translation is mine, as are comments in parenthesis. Poke the raw eggplants all over with a fork. Put them in a (large, heavy, enamel) casserole, cover with cold water and add the sugar. Boil for 10 minutes, lower the flame and simmer for 2 or 3 hours over a low flame. Make a (little sack) with a fine cloth or gauze and put in all the spices. Add the spices and half the honey to the casserole and return it to the flame. When the pot begins to boil, lower the flame and simmer over a low flame for 2 or 3 hours. Add the rest of the honey. The eggplants have to cook for another 2 or 3 hours more, until they turn very dark. 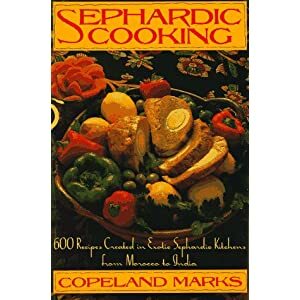 Janet Amateau is the creator of Sephardic Food, which explores Sephardic (Judeo-Spanish) food and the culture that it comes from. 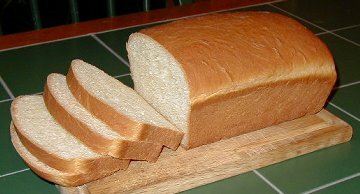 Sally Lunn Bread – A large sponge cake-like bread, more like a bread than a cake that is either yeast or baking powder based. .
Philadelphia, the city of almonds, pomegranates, olive oil, chick peas, lentils, dates, grapes, and fava beans? Thanks to the Jews who first settled the North American colonies, Philadelphia was blessed with the introduction of these Mediterranean foods. It is fun to recreate colonial recipes today in order to experience the flavors and aromas of those times and connect with an often overlooked period of the Philadelphia Jewish experience. The first Jews arrived in this area before the land was deeded to William Penn in 1682. These were Portuguese Jews who had fled the Spanish Inquisition. The first place they settled was Recife, Brazil, while it was a Dutch colony. When the Portuguese conquered Brazil from the Dutch, bringing the Inquisition with them, the Jews moved to North America. First they went to Dutch New Amsterdam (New York). Subsequently Jews migrated from New Amsterdam and settled in Philadelphia to trade furs with the Native Americans. When King George deeded the land to William Penn, the latter embarked on his “holy experiment,” creating a colony where anyone who lived peacefully was welcome. The Jews stayed. Colonial American food was a combination of English, French, and West Indian food. Local ingredients were incorporated into the diet. Benjamin Franklin encouraged people to eat corn, turkey, and other Native American foods in order to cease their dependence on British exports. Confectionery was very well developed in Philadelphia. It had the best ice cream in America! One of the most accessible and popular dishes of the time was pepper pot soup from the Caribbean. This was a one-pot meal made with inexpensive meat, seasonal vegetables, and hot peppers. George Washington served it to his troops after crossing the Delaware River to attack Trenton in 1776. For those who wish to try this at home, Mrs. Esther Levy gives a recipe for pepper pot soup in her Jewish Cookery Book, the first Jewish cookbook published in the United States, in Philadelphia in 1871. Below is an adaptation for the modern kitchen. Visiting Historic Philadelphia is fun and interesting. Recreating the meals of the colonists is a hands-on way to connect with the past. As they say in Ladino, buen provecho–with good enjoyment! Place all the ingredients in a pot and stew over a low flame for about two hours until very tender. A favorite yeast bread that arrived in Philadelphia from England was Sally Lunn bread. It is still served at the City Tavern, where Benjamin Franklin, Thomas Jefferson, and John Adams congregated. It was traditionally served with clotted cream. 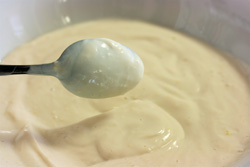 Dissolve the yeast in warmed milk. Let stand for 5 minutes. Mix butter, sugar, salt, eggs, flour, and milk/yeast mixture. Beat down and let rise again for 45 minutes. Spoon batter into a lightly greased and floured 9-inch pan. Bake at 350*F for 35 to 40 minutes. 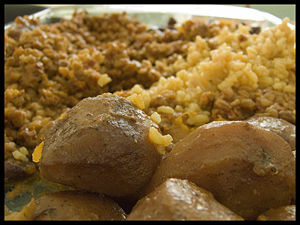 Chamin – an early Sephardic dish. .
From www.myjewishlearning.com and Sephardic Israeli Cuisine: A Mediterranean Mosaic. The earliest Jewish food in Philadelphia was Sephardic. The Jews brought olive oil and almonds from the Mediterranean to Spain and Portugal. They introduced these ingredients to the cuisine of the New World. In Philadelphia, local fish was fried in olive oil, not lard. This became known as “Jew fish,” and was a favorite of Thomas Jefferson. Almonds were baked into a pudding. 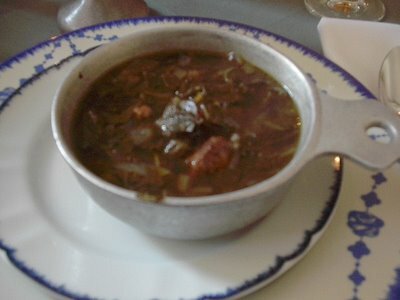 The Jewish Sabbath stew, Chamin, made with beef, beans, and onions was also introduced. To replicate a Colonial Sephardic Shabbat meal, one should cook Chamin. In a large pot, heat the oil and sauté the onions and garlic until soft and translucent. Add the chickpeas, bones, meat, potatoes, honey, paprika, cumin, allspice, cinnamon, turmeric, saffron, parsley, and salt and pepper to taste. Add enough water to cover, place the unshelled eggs in the center, and bring to a boil. Reduce the heat to medium low, and simmer for 1 hour. Skim off the foam occasionally. Cover the pot tightly, place in the oven, and cook overnight, or cook on low on the stove for 5 to 6 hours, or until meat is tender and done. In the morning, after cooking all night, check the water level. If there is too much water, turn the oven up to 250°F or 300°F, cover, and continue cooking. [If cooking over Shabbat, traditionally observant Jews would refrain from changing the heat level, for doing so would run counter to Sabbath laws against manipulating flame and cooking.] If there is no water, add another cup, cover, and continue cooking. To serve, place the chickpeas and cooking liquid in one bowl, and the eggs, potatoes, and meat in separate bowls. One of the most authentic Portuguese Jewish foods is almond pudding. It is the perfect dessert to serve at the Shabbat dinner. Beat the egg yolks until foamy. Add the sugar, almonds, and almond extract. In a separate bowl, beat the egg whites until stiff. Fold the egg whites into the yolk mixture. Pour into an 8-inch oven safe dish, which has been oiled and dusted with matza meal. Top with strawberries or strawberry puree and serve. Ronit Treatman was born in Israel and grew up in Ethiopia and Venezuela. She is fluent in five languages, and volunteered for the IDF where she served in the Liaison Unit to Foreign Forces. She currently lives in the Germantown section of Philadelphia with her husband and three children. Is Your Jewish Family from Poland Originally From Spain? My family left northern Spain, likely around the time of expulsion in July of 1492. I am unsure what path they took to arrive in Poland, but oral tradition suggests that my Jewish family settled in the town of Hrubieszow in southeast Poland (near Lublin and Zamosc) by 1600. The surname they eventually adopted sounded much more Eastern European than Spanish. I talk more about the origins of the surname below. It’s possible my family was Ashkenazic and migrated west to Spain from another place, and then migrated back east after expulsion from Spain, but it seems more likely that they actually were Sephardic. Concluding Shabbat davening with Ein Kelahaynu instead of Adan Olom is a Sephardic practice. 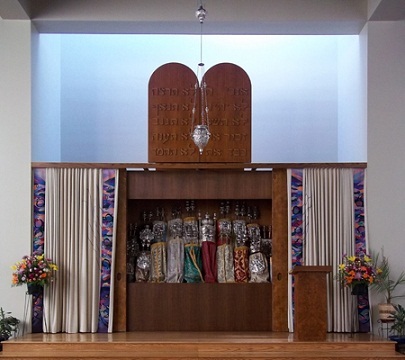 There may have been a synagogue in Hrubieszow before WWII which was Sephardic, where my ancestors prayed. The family was religiously observant but not Hasidic even though the town they lived in (Hrubieszow) was a mostly Hasidic town. There is an oral tradition of arrival in the area in Poland in the mid-1500s. Jews had a very difficult time in Europe during the later portion of the Middle Ages. The beginnings of some of the behaviors of the Holocaust can be traced to the period in Europe from 1200 to 1500. Throughout Europe, the Jews were gradually confined in ghettos as the Middle Ages progressed. The first compulsory ones were established in Spain and Portugal at the end of the fourteenth century. Jewish ghettos existed in Madrid, Barcelona, Venice, Naples, Rome, Florence, Prague, and other European cities (Source: Jewish Displacement). Beginning in the 8th century, Muslims had occupied and settled most of the Iberian Peninsula (Spain). Jews, who had lived in these regions since Roman times, were considered “People of the Book”‘ and given special status and often thrived under Muslim rule. The tolerance of the Muslim Moorish rulers attracted Jewish immigration, and Jewish enclaves in Muslim Iberian cities flourished as places of learning and commerce. Living conditions for Jews in al-Andalus became more difficult after the fall of the Muslim Umayyad Caliphate around the year 1030. The Reconquista was the gradual reconquest of Islamic Iberia by the Catholic kingdoms with a powerful religious motivation: Iberia was being reclaimed for Christendom. By the 14th century, most of the Iberian Peninsula, present day Spain and Portugal, had been regained from the Moors. Overt hostility against Jews became more pronounced, finding expression in brutal episodes of violence and oppression. Thousands of Jews sought to escape these attacks by converting to Catholicism. The Alhambra Decree (also known as the Edict of Expulsion) was an edict issued on March 31, 1492 by the joint Catholic Monarchs of Spain (Isabella I of Castile and Ferdinand II of Aragon) ordering the expulsion of Jews from the Kingdom of Spain and its territories and possessions by July 31 of that year. The punishment for any Jew who did not convert or leave by the deadline was death. Scholars disagree about how many Jews left Spain as a result of the decree; the numbers vary between 130,000 and 800,000 (Source: Wikipedia). Toward the end of the Middle Ages, Jews lived in 85 towns in Poland, totaling 18,000 — a mere .6 percent of the total population. But the 16th and the first half of the 17th century saw increased settlement and a relatively fast rate of natural population growth of Jews in Poland. Among the new arrivals there were not only the Ashkenazim banished from the countries belonging to the Hapsburg monarchy, but also Sephardim who were driven away from Spain and Portugal. Beginning in the middle of the 16th century, Jews started to settle in the countryside in larger numbers. During the hundred years of the 15th century, the Jewish Polish population exploded from about 15,000 to 150,000. In the middle of the 17th century there were 500,000 Jews living in Poland — five percent of the total population. During the 15th and 16th centuries, Poland became the center for Jewish learning. Between 1501 and 1648, Jews intensified their economic activity. The primary sources of income for Jewish families were crafts and local trade. The rapid development of Jewish settlement and economic activity was accompanied by expansion of their self-government organization. As in the Middle Ages, every autonomous Jewish community was governed by its kahal — a collegiate body composed of elders elected as a rule from among the local wealthiest. The kahal organized funerals and administered cemeteries, schools, baths, slaughterhouses and the sale of kosher meat. In the closed “Jewish cities”, it also took care of cleanliness and order in the Jewish quarter and the security of its inhabitants. Administering charities such as the organization of hospitals and other welfare institutions and the dowering of poor brides were also taken on by citizens or organizations within these Jewish communities (Source: Mike Rosenzweig). There was a period when members of the Sephardic middle class could establish themselves with some distinction in Poland. This most important page in the history of Sephardic Jews in Poland began with the reign of the Polish King Sigismund II Augustus (1529-1572). At that time, one of the most influential statesmen of the Ottoman Empire was Don Joseph Nasi, a Sephardic Jew who died in 1579 (Source: Alexander Beider). In 1588, Polish Chancellor Jan Zamoyski established a special privilege allowing Sephardic Jews to live in his own newly founded private town of Zamosc. Many advantages were offered to those Sephardic Jews who decided to move there, which prompted a number of Sephardic families to migrate to the town. During the first part of the 17th century, new settlers generally came from Italy and Holland, according to Alexander Beider. Some of the Sephardic Jews left the area; others intermarried with Ashkenazic Jews. As a result, during the second half of the 17th century, Sephardic names do not appear in the historical documents of Zamosc and Lvov. The census of 1664 showed only 23 Jews in Zamosc, most Ashkenazic. The presence of Sephardic families in the territory of Poland during the 16th to 18th centuries did not influence the surnames used by Polish Jews during the 19th and 20th centuries. The cultural fusion of foreign Sephardic Jews with local Ashkenazic Jews, who had lived in the same area for several centuries and were far more numerous, was rather rapid. The Sephardic Jews lost their language, and their descendants used Yiddish as the vernacular. They dropped their Sephardic names and were named according to local Ashkenazic patterns (Source: Alexander Beider). Jews lived in Russia for centuries — sometimes welcomed and other times barely tolerated. Before 1500, Jews were permitted to live anywhere in Russia. As Russia’s western boundary moved west in the 1600s and 1700s, more Jews were annexed into a country which was intolerant of Jews. In the late 1700s, Catherine the Great decreed that Jews could only live in the territory along the western Russian border, known as the Pale of Settlement. In 1772, more Jews lived in the Pale than in the rest of Europe. Prosperity continued until the second half of the 17th century, when a series of massacres by Cossacks ruthlessly killed Jews and Gentile Poles alike. Poland was then pummeled by another Cossack uprising, two invasions by Sweden, and a war with Turkey. In the 1700s, Poland was divided three ways, and the Jews of Poland fell under the rule of Russia, Germany, and Austria (Source: Jewish Displacement).